Thank you so much for all your sweet comments on yesterday’s post. I promise I wasn’t intending on fishing for compliments, but you all made me feel so special. Maybe it’s just my crazy hormones, but I might have teared up once or twice reading your kind words. Half a whole wheat bagel with house cream cheese (picked up from my favorite- NY Deli!). 1 egg, 1 slice of natural bacon and some spinach leaves. 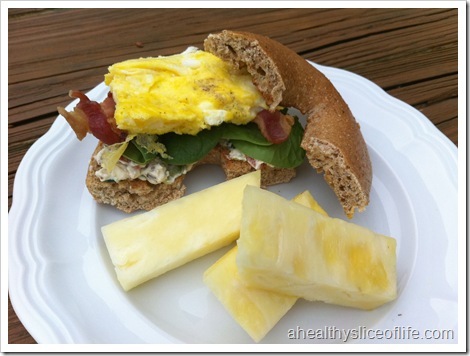 A few slices of fresh pineapple on the side- YUM. Oh yes, there was a cup of decaf with 1/4 c 2% milk as well. I tried to get the Baby D in the picture, too, but it didn’t work out so well. 3.5 miles in about 1 hour. And it’s crazy how my heart rate gets up so quickly! A Chobani Champion Very Berry (Promise I’ll go back to buying the grown up version next time I buy it!) 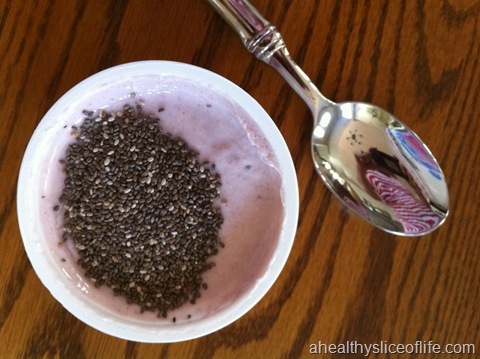 with chia seeds. A La Tortilla Wrap (my favorite!) 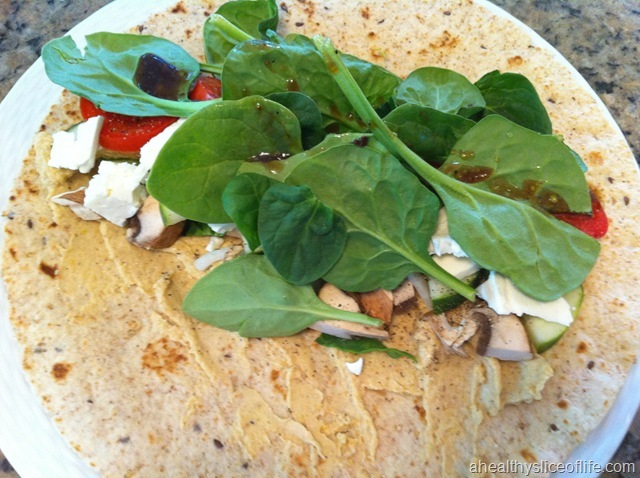 with Roots Garlic hummus, cucumber, mushroom, roma tomato, onion, feta, spinach and a drizzle of Newman’s Light Balsamic. I was out and about and suddenly felt really faint, so I grabbed what was close by. 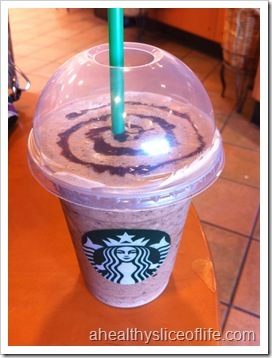 A small decaf Java Chip Light Frap from the ‘bucks. 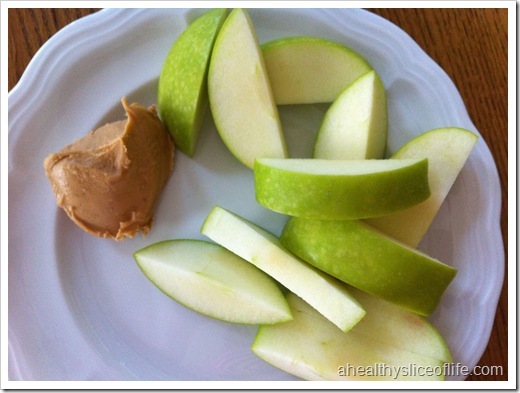 Granny Smith apple, sliced, with 1 Tbsp of PB&Co’s White Chocolate Wonderful on the side. Like dessert! We met some special guests that are in town visiting us for dinner at The Salty Caper, a local pizza spot. I arrived starving and started of with a salad. 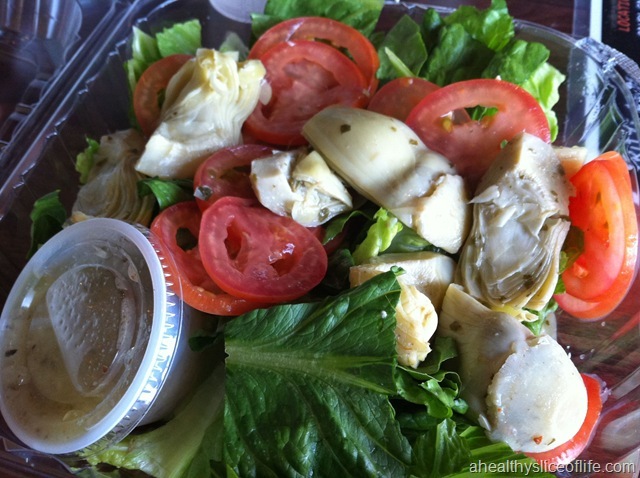 A mix of romaine, artichoke hearts and tomatoes. A little lackluster, but it got food in my system! Then we ordered a veggie pizza. 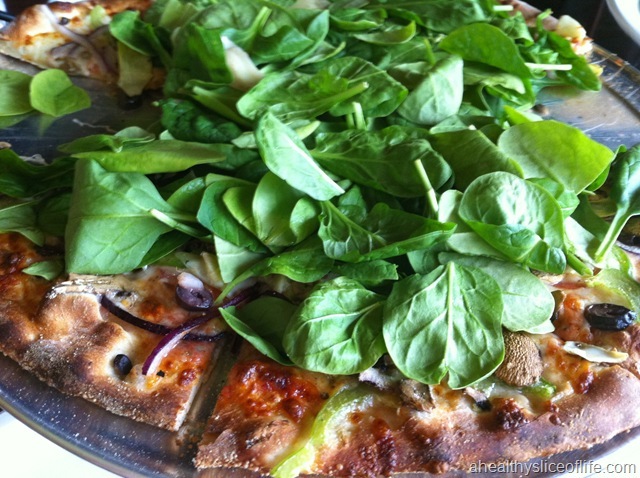 It’s thin crust with lots of veggies, only a little cheese and lots of spinach on top. 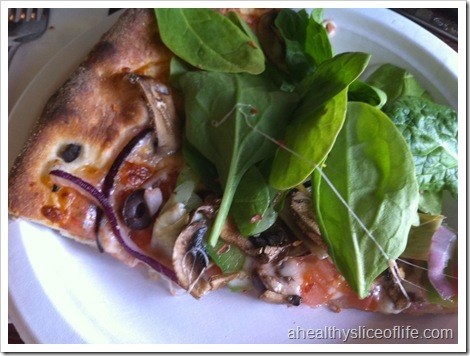 I devoured 2 delicious slices and guessed best I could on the nutrition content. I ended up using Pizza Hut Thin Crust since The Salty Caper doesn’t have nutrition info available. My thoughts: probably a little low on calories. Funny how I feel like I eat so often, but my calories end up possibly being a little low for what they should be, especially with my exercise. I eat whenever I’m hungry, though, so I’m not too concerned with it. 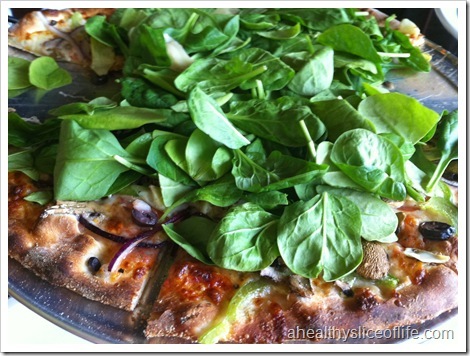 Sodium is way too high, but what do I expect with eating pizza out at a restaurant? Hey! 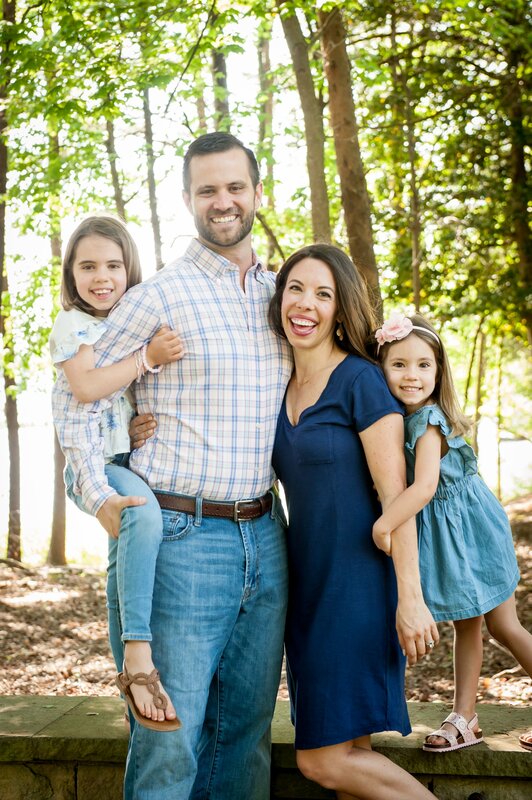 I just found your blog through WIAW!!! 🙂 Love it! Super cute and you’ve got so much tasty food!! I love everything on there 🙂 Especially hummus wraps. 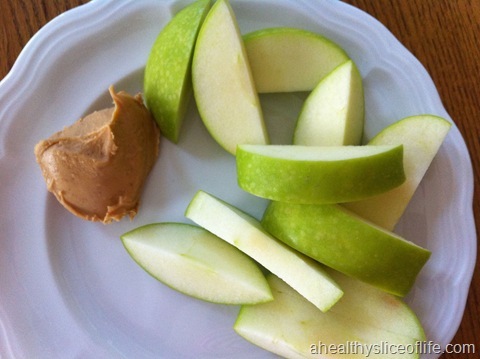 And apples & pb are like my go-to snack!! It’s crazy how easily we start to feel faint. I had to leave church for a bit on Sunday and get a lot of water because I was starting to feel wobbly. It’s also crazy when you think that 1600 calories isn’t enough anymore. All of your food always looks so good. I am going to have to start making wraps like that. Where do you get your tortillas? I have trouble finding ones I like. I hope things are going well with you and baby D. I go in for my glucose screening in 2 weeks. I am so not looking forward to drinking that crap! Your food always looks so good, and so healthy! 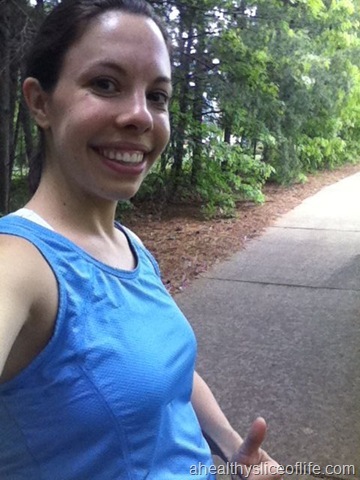 I am so impressed–I was not nearly as diligent when I was preggers (although with the next one, I’m going to be better!). My favorite thing I ate yesterday was a homemade caesar salad. Easy, tasty, light dinner. The dressing is much more thin than the thick stuff in the bottle. 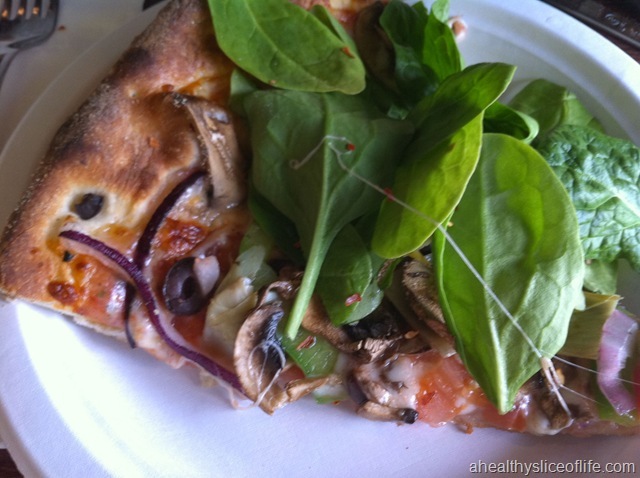 I’ve never seen a pizza with that much spinach on top! It looks really good. 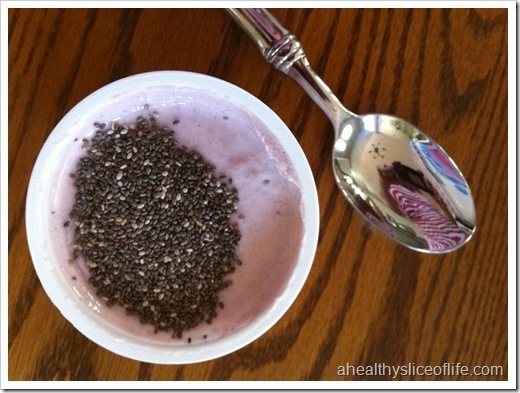 You also have the most amazing breakfasts that I’ve ever seen for weekdays. Props! 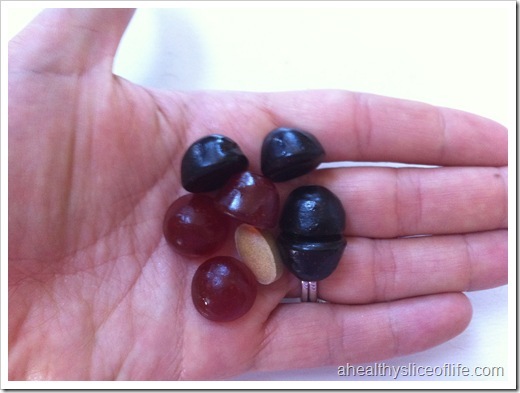 I am always so envious looking at what you eat!!! Everything looks so fresh and wholesome!! 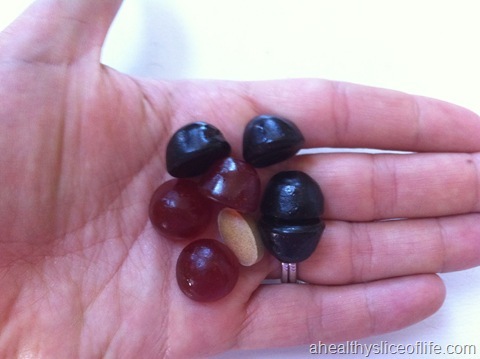 My fav thing yesterday was my edamame and grapefruit snack! =) love it! I want a la tortilla veggie wrap noooow! =) hehe! happy WIAW Brittany! I’m not sure I can choose a favorite- I ate an Amy’s tofu scramble with hash browns and veggies for lunch, but at dinner, I had coconut butter(!). The heat is starting to soften it up:-). 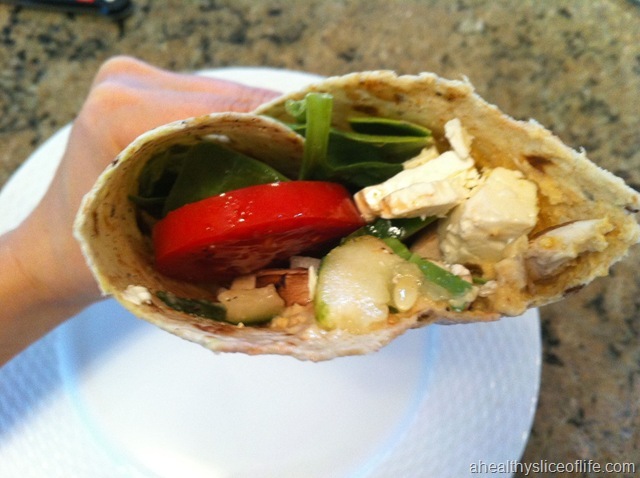 That wrap looks fabulous, yum yummm feta! 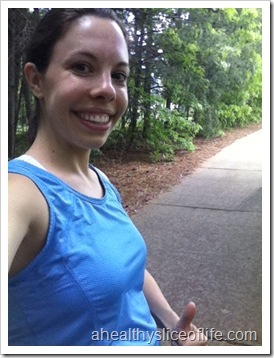 I love the walking photo with the thumbs up! Those are some good eats. I am super excited to start doing Greek salads again. mmm those are some of my favorites in the summer. Its crazy how much sodium we consume. I had a seminar on it at work and most of the sodium comes from processed foods (to stop bacterial growth, textur etc) the companies are trying to lower it but noone is buying their product. Its etimated that it takes about 2 weeks for your taste buds to adjust to low sodium foods (but would you eat the same soup/bread/anything for two weekes waiting for that to happen? That is a great way to eat pizza!! 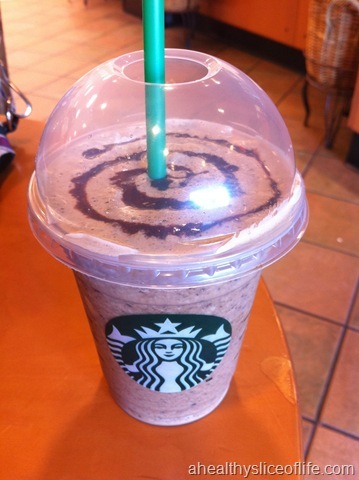 Looks yummy. The best thing I ate today way my chocolate-flax granola with cottage cheese! I finally got around to making it tonight! Soooo good(http://greengroat.blogspot.com/2011/04/choco-flax-protein-granola.html)! I like your lunch. 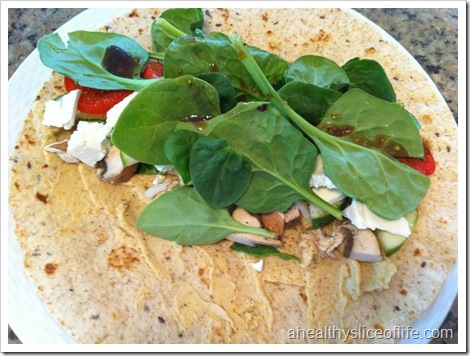 Also had a seeded wrap this afternoon for lunch filled with ground beef and raw spinach. Yum.